jennie's nails and tales: It's NYE already? How is that possible?? The last 365 days have made up the fastest-passing year that we've had in a long time but I guess that means we're having a good time! Haha. A lot of our 2010 highlights are related to the change in scenery from Ontario to New Brunswick. Although technically we moved out to the East Side in late 2009, we consider 2010 our first year in The Maritimes. As expected, it's one of the best decisions we've made for ourselves. The boys love running around the yard and chasing after the various wild creatures that wander out from the forest. We love that we have almost total privacy...in a subdivision...10 minutes from town. It's the best of both worlds. The Hubby's much happier with his job out here and has moved up the ranks to Foreman very quickly. He's currently running one of the largest job's his company has done (and he's doing a fantastic job despite the ups and downs that come with the construction biz). In fact, about two months ago he was given a company vehicle! Last night, we sold his beloved Jetta. I'm very excited to make the call to our insurance company this morning to remove the car from our policy!! Cha-ching! My health has stabilized considerably when compared to 2009, which has been a seriously appreciated bonus. I'm still in a holding pattern and taking non-GTL steroids while I (not so patiently) wait for the new super-drug to become available but the cocktail lets to venture out of my house on an almost daily basis without too much concern. I've even able to go to a bar and/or a movie once in a while. All good things. In March, we took a last-minute trip to Mexico. It was our first trip together since we got married almost three years ago. We reconnected as a couple and have gotten even stronger as a couple since. I can't wait until I'm well enough for a European Vacation (fingers crossed for 2012!). When I look at this picture, which is enlarged and framed behind our living room couch, I wistfully remember the break. There was some argument on whether this chair could be classified as "giant." I believe we settled on "moderately large." It's in the Tremblant village and is also the site for my accidental face-slap of a three-year-old girl...whoops! The Hubby and I received amateur-baker status by taking 2 Wilton cake decorating courses last winter. Although labour intensive, they were a lot of fun (except for the teacher who was THE WORST *shaking fist). I practice my fondant skills whenever a birthday rolled around. 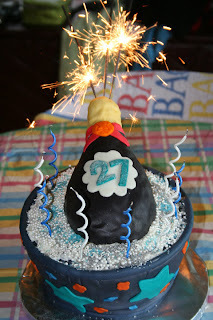 By far, my most favourite baked creation of 2010 was my Hetero-Life-Partner's 27th birthday cake. It was her champagne birthday. This cake also marks my first with special effects (haha...sparklers make everything better). He had a campfire party...so I made him a campfire cake! I also got back into painting and had a wonderful time making gifts for my family. Just so we're clear -- I took a class at summer camp when I was 11, so I don't really know what I'm doing. It's been really fun trying to figure it all out. My favourite was one I did for my Baby Brother's birthday. Baby Brother lived in Vancouver for a while. He loved to go for laps around the seawall. I grabbed this picture off of his FB. It's the longest I've ever worked on a piece and I think it shows (please excuse the flash). Truth be told, he almost didn't get it...I kid, I kid. 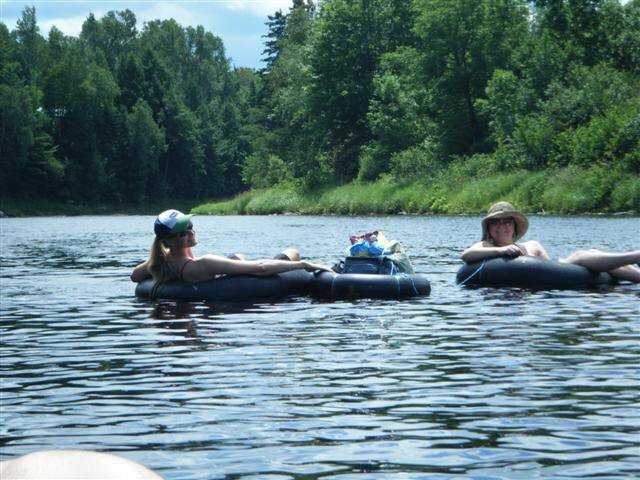 This summer also marked the first time we went tubing. Sure, I'd heard of "lazy rivers" at amusement parks and have floated around in a circle on more than one occasion but THIS is WAY BETTER than that. A friend introduced us to a company that rents tubes out on a nearby (and very long) river. They drive you upstream, drop you off and then you spend a few hours floating back. A friend once described it as "white trash spring break" and on a Saturday, it's a fairly accurate description. Whenever anyone came to visit during the hotter months, this is what we did. Yes, your eyes aren't deceiving you. Even our cooler has its own tube. Best Summer Activity Ever, I can hardly wait for July. So there they are -- some of the awesome-ness that was our 2010. I'm incredibly grateful for all of the great times we had and am looking forward to what 2011 has in store for us. So far, we're off to a fantastic start (details to be revealed at a later date...stay posted...no, we're not pregnant ;) ). We're not really New Years Resolution kind of folks and therefore, don't have any but I really want to give a SHOUT OUT to my HETERO-LIFE-PARTNER because she has decided that 2011 is the year she will QUIT SMOKING!! *confetti eruption, firework explosion, gong smash* Way to go girl, this will be one of YOUR Best Decisions Ever and I'm VERY PROUD of you. Have a great & safe NYE everyone! !